Through MWA her activism received international recognition in 2006 after a successful campaign to avert removal of a prayer space in view of the Kabba designated for women in the courtyard of Makkah's Grand Mosque. 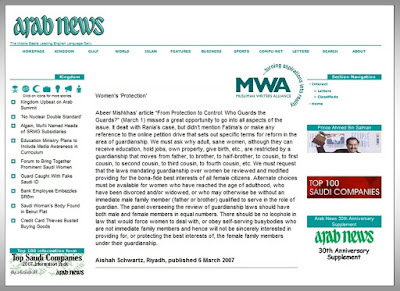 In an October 2006 issue of Al-Ahram Weekly, Margot Badran wrote, "Aishah Schwartz, founder-director of the Muslimah Writers Alliance in Washington, set up the Grand Mosque Equal Access for Women Project that circulated a petition protesting the restrictions [on women]. Very quickly over a thousand signatures were collected. Women inside Saudi Arabia and around the world, meanwhile, carried on protesting in the media. It was the most striking example to date of concerted Islamic feminist global protest and one that authorities could not ignore."